Only his honest reply to the question can throw any light upon his adaptability to homoeopathy and only upon an honest consideration of his adaptability can we prophesy what homoeopathy has to offer him. Why is he thinking of studying medicine? Is he lazy and does he consider a profession an easy way to earn a living? Does he look upon medicine as a profession to be sought because of its honourable place in the community or as a position to be desired to secure a standing in society? Has he an ambition to be hailed as a great surgeon or bacteriologist? Is he thinking first of the possible financial returns? If he would use his foothold as a physician for a life of ease, for a position in the community or in society, or for a means of obtaining fame or wealth, homoeopathy offers him little that he would care to accept. How does he react to the fads of the day, the bulletins of the laboratories, the specious advertising of pharmaceutical houses, the glib talk of salesmen? Does he believe that colloids are, after all, homoeopathic potentiations? Or is he convinced that colloidal preparations are but recent and crude imitations of homoeopathic potentiation which are inferior and far more uncertain in their effects than the proven homoeopathic remedy? If he replies to your question of his idea of the direction of his future so that it leads you to think that he looks upon sick humanity as suffering men and women, that he has a burning desire to serve them, to help them to better health and therefore greater usefulness and happiness, then you may be sure there is a sound foundation upon which he may build a plan of life in which homoeopathy will offer him great reward. We can proceed further with our probing of his character and abilities, and determine what homoeopathy has to offer him by finding out what he has to offer homoeopathy. One of the first essentials, now that we are convinced of his unselfish desire to serve, is to determine whether he has stability. If he is mercurial in temperament, easily influenced, and finds it difficult to hold a straight course, always seeking the easiest way, do not encourage him to study homoeopathy. Homoeopathy is founded upon principles that are in turn founded upon natural laws. If homoeopathy is founded upon natural laws, it is as basic and eternal as the hills; more, natural laws were formulated before the hills came into being. If a man follows where homoeopathy leads, he must be able to follow those laws and to hold close to them regardless of the pressure of influence. Stability of character must have with it, and in equal measure, the quality of patience. In ordinary medicine the quality of patience seemingly is not so necessary, since we too frequently find that in extreme cases where things have taken an undesirable course the physician comforts himself that "everything possible has been done for the patient". In homoeopathy, one of our greatest axioms is: When in doubt, don't. The homoeopathic physician must be able to plan his course, and once having determined upon it, to stick to it until he finds good reason for changing his course; he must be able to wait. The man who considers homoeopathy as a possible future must be a student of people and willing to become a student of philosophy. He must be able to read between the true and the false in any symptoms the patient may give; he must possess a sense of values. He must train himself to observe all those signs which the vital energy writes upon the human face, and he must be able to interpret all the signs, which show through habits and circumstances, into indications for the health-restoring medicines which he has at his command. Hours must be spent in patient study, tracing the course of the disturbance and the remedy to fit it, always basing the process upon the sound rock of natural law. To the young man who is equipped, and willing to undergo the training for this lifelong task, homoeopathy has everything to offer. In the first place, homoeopathy offers to the independent mind an opportunity continually to seek new verifications of the natural laws upon which this system of medicine is based. It opens up vast fields to the pioneer, and we cannot gauge the distance that eager minds may travel, nor how greatly the interpretations of these laws may influence the civilization of the future. Homoeopathy offers a life of service to humanity, and it is the only method of healing that surely sets the sick man and sick woman on the permanent road to recovery. We must remember that though we may fail, the failure is ours; it is not the failure of homoeopathy. The better knowledge we have of the "tools of our trade" the better use we should make of them. Homoeopathy treats the sick individual; it is therefore a specialty. In spite of the trend toward group practice, group thinking and even group mode of life as seen all about us to-day, we have yet to be convinced that the man is not greater than the mass and that as long as intelligent thinking people realize and prize their individuality, the individual approach will hold an appeal to them. Therefore, homoeopathy offers a special inducement to the man who can teach people to think and act as individuals, and to demand medical treatment as individuals. Homoeopathy considers the man as a whole, not just his individual parts. Therefore, primarily homoeopathy has less appeal for the man of mechanical bent, for it is this man who makes the best surgeon. Instead, homoeopathy offers a gentler way toward health of the entire individual. One thing the student must consider is the differentiation between medicine and public health service. Public health service, ideally, has to do with the prevention of disease in the community, in guarding food and water supplies, in providing facilities and restrictions for adequate healthy housing conditions and in attending to the proper disposal of waste matter, so that the health of the community will be guarded against epidemics borne by impure water, milk or other food supplies, or born in insanitary or unhygienic conditions. Medicine ideally has to do with the cure of disease, the building up of the individual, not overlooking the proper hygiene and sanitation, but with a deeper view of the needs of the individual himself, rather than the needs of the community. Homoeopathic medicine goes even further than this, for homoeopathy seeks to relieve the individual as much as possible from the heavy burden of the hereditary tendencies he carries, and to guard against increasing this load by enabling his vital energy to provide its own immunity against disease. Homoeopathy looks upon the health of the individual as a precious charge, and the return of the individual to health as almost certain if we but follow the fundamental laws. The homoeopathic school accentuates the study of the action of drugs upon healthy human beings, with little consideration of their action on the lower animals, for homoeopathy recognizes that it is only through a knowledge of their action on man that we can obtain a correct perception of their applicability in disease. The field here is ripe for much investigation, and the results of such investigation would enrich the homoeopathic materia medica by completing provings of some of the older remedies, and by bringing out provings of new remedies. This is an opportunity that only homoeopathy offers, for the teaching of remedy reaction has ceased in ordinary medical colleges. The decision lies with the individual, and what he is determined to secure from his life work. If it is financial ambition, he had better not take up homoeopathy. Homoeopathy is a principle, and principles brook no division of loyalty. If he has at heart the desire to serve, he may find fame and riches at his door as well as that keen satisfaction of knowing that he has brought to his clientele the gift of healing in the safest, gentlest and most rapid manner. For the man who can help the community, as individuals, toward a higher level of health, the community has a place of honour; for the man who can assist Nature to cure serious illness a certain fame in the community there is burning, perhaps not the bright flame of the comet, but a steady glow of light for his path. For the man who spends himself unceasingly for those about him the community will return a comfortable livelihood, not the spectacular fortune offered in some lines of endeavour, but a competence which will enable him to keep his family in a well-earned place in the community. 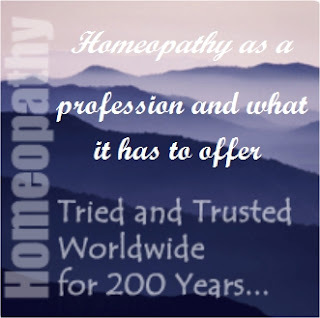 Homoeopathy as a profession carries a challenge. The possibilities of its art are infinite. What future has homoeopathy to offer to you? Young man, what have you to offer homoeopathy?